Get all the quick facts you need to know before your pharmacology exam. Antacids – Reduce hydrochloric acid located in the stomach. Antianemics – Increases the production of red blood cells. Anticholinergics – Decreases oral secretions. Anticoagulants – Prevents the formation of clots. Anticonvulsants – Management of seizures or bipolar disorders. Antidiarrheals – Reduce water in bowels and gastric motility. Antihistamines – Blocks the release of histamine. Antihypertensives – Decreases blood pressure. Anti-infectives – To get rid of infections. Bronchodilators – Dilates the bronchi and bronchioles. Diuretics – Increases excretion of water/sodium from body. Laxatives – Loosens stools and increases bowel movements. Miotics – Constricts pupils of the eye. Mydriatics – Dilates the pupils. Administer librium during alcohol withdrawal. Antabuse is given for alcohol deterrence. Do not take over the counter cough medicine. When taking hypertensive medications, teach patient about orthostatic hypotension. Patient must change positions slowly. Administer diuretics in the morning so patient doesn’t constantly wake up to urinate. Digoxin = Side effects are increased when the patient is hypokalemic. Monitor the potassium. Digoxin has a negative chronotropic effect (slows the heart rate). Hold the dose if heart rate is less than 60. Digitalis toxicity = bradycardia, tachycardia, dysrhythmias, nausea, vomiting, and headache. Contact physician as soon as possible. MAOIs – Do not give food with tyramine as it may cause hypertensive crisis. Do not give tetracycline at bed time. Do not let patients lie down because it might cause gastric reflux. 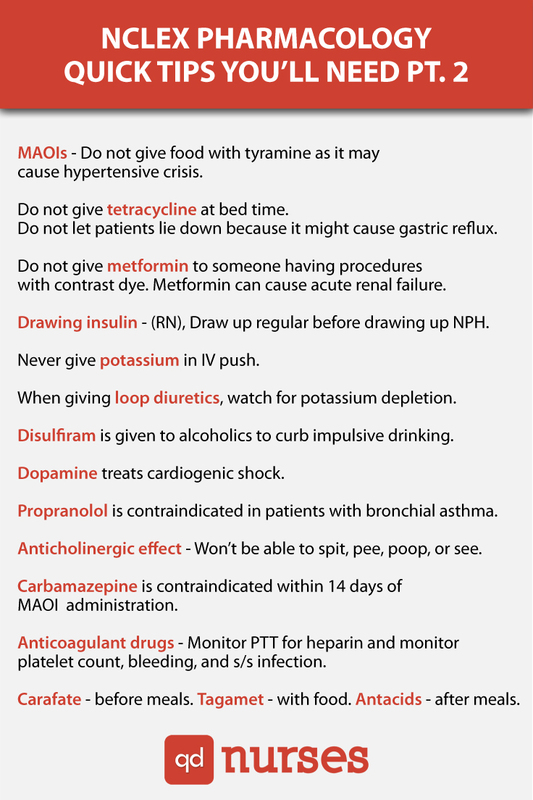 Do not give metformin to someone having procedures with contrast dye. Metformin can cause acute renal failure. Drawing insulin – (RN), Draw up regular before drawing up NPH. Never give potassium in IV push. When giving loop diuretics, watch for potassium depletion. Disulfiram is given to alcoholics to curb impulsive drinking. Propranolol is contraindicated in patients with bronchial asthma. Anticholinergic effect – patient won’t be able to spit, pee, poop, or see. 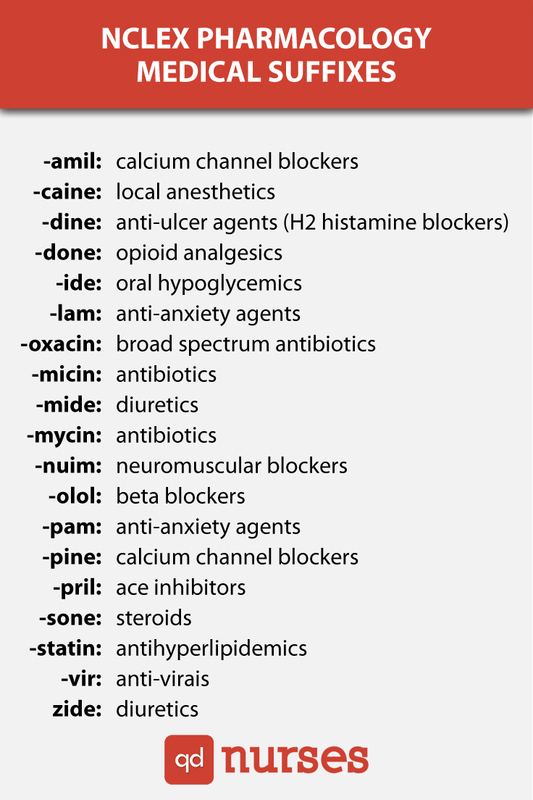 Carbamazepine is contraindicated within 14 days of MAOI administration. Anticoagulant drugs – Monitor PTT for heparin and monitor platelet count, bleeding, and s/s infection. Carafate is taken before meals. Tagamet is taken with food. Antacids is taken after meals.